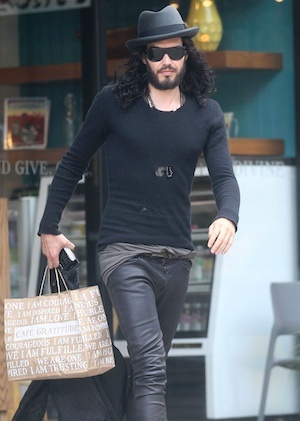 Russell Brand was arrested on March 15 after yet another altercation with the paparazzi. Prosecutors in Louisiana upped the charge to a felony but Brand’s attorney says that won’t hold up for long. TMZ reports Russell Brand claims he was provoked during a March 12 incident that landed him in jail. Brand allegedly grabbed Timothy Jackson’s iPhone and threw it through a window of a law firm when Jackson — a paparazzo — attempted to take pictures of Brand with the phone. The Toronto Sun reports Brand paid $240 to fix the window but it is still unclear if Brand paid for the damage to Jackson’s phone. A warrant was issued for Russell’s arrest on March 15, 2012 but Brand turned himself in. He posted a $5,000 bail and was released within minutes. He now faces a felony charge which carries a penalty up to two years in prison. Prosecutors increased the charge to cover the value of the window and the iPhone. The misdemeanor charge carried a maximum fine of only $500. However, TMZ said his attorney — Robert Glass — will argue the felony charge is bogus since Brand already paid to fix the window. It’s not likely the damage to Jackson’s phone exceeds $500.